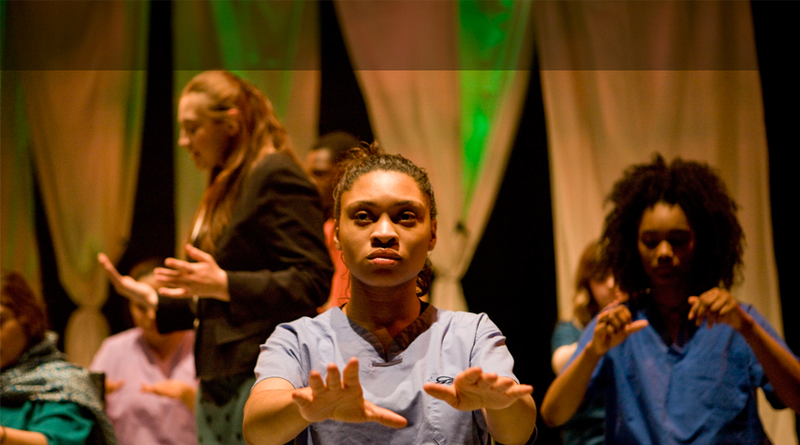 The Theatre Acting Program is designed to train actors in a wide range of skills, techniques and experiences that provide a broad overview of theatrical performance, practice, history and literature. The overall arc of the program is to begin by establishing a foundation in the first year, moving into progressively more challenging work in years two and three, and finally exploring each student’s unique artistic voice in the final year. The end goal is to provide a high level of instruction and experiences that prepare students for further study at the college level or entrance into the profession. Movement for actors is an introduction to body awareness, centering, strengthening and balance. It is essential that beginning actors become aware of their body moves through space so that a deeper discovery of character creation can happen onstage. Methods used to achieve this goal include basic yoga, Laban Movement Analysis, Lecoq, Spolin space work, and movement to music. This class is a survey of Western theatrical history, drama and practices from Classical Athens through the Restoration. Students will study the social, political, cultural and historical influences of each period to understand the context in which theatre was created. Likewise, they will explore the means by which theatre was produced and practiced including theatre companies, acting styles, design and architecture. They also will study the dramatic literature of each period including a critical analysis of each text. The focus of the Voice and Speech I class is to create a greater awareness of and connection to the actor’s natural voice. Further, it is to free that natural voice toward greater psychological and physical connections and improved self-awareness, imagination, expressiveness and embodiment. Students will focus on breath and vocal production, opening the physical channels of communication, exploring physical alignment, and releasing tension to begin to build vocal strength and connect the voice to creative impulses. The first year also will introduce basic diction. A continuation of the first year’s study with an emphasis on 19th, 20th and contemporary Europe and the United States. An exploration of movement through space and in groups. Specific content includes Viewpoints technique in the fall semester and Contact Improvisation and/or other techniques in the spring semester. A continuation of the work begun in the freshman semester with an emphasis on integrating vocal technique with various contemporary texts. The focus is on refining the actor’s use of their voice through deepening their experience of resonance along with clarifying vowel and consonant articulation. Basic elements of speech will be explored to help the actor bring vocal clarity, energy and point of view to any text. Preparation for college auditions and/or entrance into the profession including an overview of the business of acting and audition preparation. One semester focusing on basic weaponry combat and the integration into scene work. One semester of comedic movement focusing on commedia dell’arte, LeCoq or other techniques. The application of stagecraft and design techniques to the Senior Project and other productions. An introduction to the work of the director with an emphasis on text analysis and working with actors on scene study. An introduction to the skills and techniques needed to act for the camera and for voiceovers as well as an overview of the audition process for each.